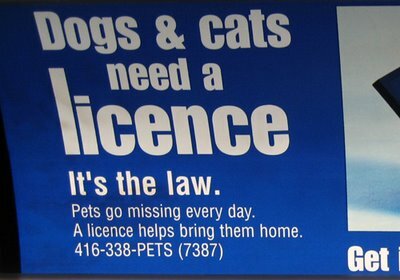 Submitted by Lilit, this awkward "Dogs and cats need a licence" sign doesn't exactly meet the criteria for a genuine lowercase L offense here, but it is an interesting find nonetheless. Posted on The anti-social event of the season, a blog about kerning, punctuation, and other printed text problems, the author takes umbrage not with a lowercase L amidst uppercase letters, but with an unusually tall lowercase L. Other readers noticed that licence was spelled incorrectly. I think it's spelled right if you're British. But this is AMERICA, bastards! Licence is correct - I think it's a similar verb/noun differentiation to practise vs practice. We're not all in America! excuse me, that's an American-style area code in the phone number! Toronto's posed as New York long enough to earn US citizenship. That's clearly a capital lowercase L.